I got a Syma S107G IR controlled helicopter for my son a while ago. This tiny remote control helicopter is a rather amazing toy. Not only its movement is very stable, but the rotor speed, forward backward movements and turning can be all proportionally controlled as well. I thought it might be interesting to take a look at its control protocol to see how things are done. And yes, I do have a video at the very end showing controlling the S107G using the reverse engineered remote control. Well, it appeared that the transmitter for the S107G uses an MCU to do all the encoding which means that without taking a look at the actual code, there isn’t too much information I could get by just staring at the board. Unfortunately, the marking of the MCU was purposefully sanded off (a rather common practice in the commercial world) so I couldn’t figure out the actual microcontroller used in the circuit easily either. By looking at the silkscreen though, it seemed that the transmitter works at either 38kHz or 57kHz, which corresponds to either channel A or B that the transmitter can operate on. Another piece of information I gathered is that three potentiometers are used to control the throttle and directions. Presumably, the voltage outputs from these potentiometers are coupled onto the ADC pins of the microcontroller. So I decided to dig a little big further by analyzing the actual IR signal. The first step I took was to view the IR signal sent from the transmitter. This can be done in a couple of ways, one way is to measure the waveform directly from the output photo diode on the transmitter and the other way is to use a receiver circuit and measure its signal output. Here, I used the latter method. 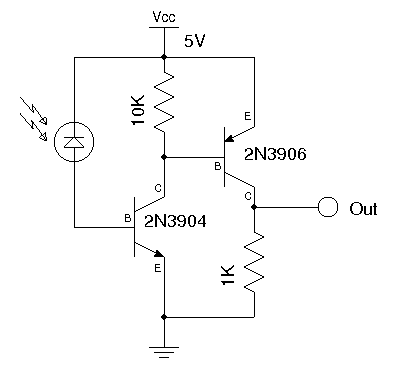 The following schematic shows the simple IR receiver I made to analyze the signal. 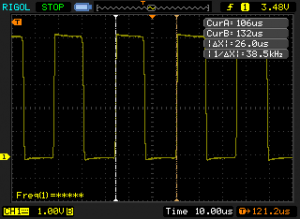 First I wanted to see the modulated IR waveform so I used a standard IR photo diode as the sensor and hooked up the output to an oscilloscope. 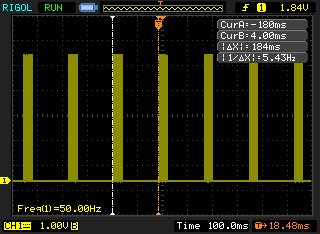 From the data capture, we can see that the IR command repeats at an interval of 184 milliseconds. Zooming in onto each section we can see the modulated IR signal. The image below on the right shows the modulated waveform of a command, repeating at an interval of 184 milliseconds. 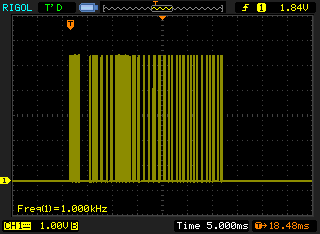 And by zooming in further, we can see that the IR signal is modulated at roughly 38kHz which corresponds to one of the transmitter’s operation modes. The carrier waveform has a duty cycle of roughly 50%. In order to analyze the IR encoding scheme, we will need to use the demodulated waveform. IR demodulation can be done by replacing the IR photo diode I used earlier with an IR sensor as most IR sensors designed for remote controls demodulate the carrier signal automatically. Since the transmitter’s output waveform would vary depending on the control levers’ positions, I decided to record a few waveforms with different control positions. And by comparing these recorded waveforms, hopefully we can infer how the control positions are encoded. The following waveforms are recorded using a combination of throttle and direction control lever settings (click to enlarge). To obtain these waveforms, the oscilloscope was set to deep memory mode and the results from each individual run were trimmed so that the beginning of the commands are aligned. Note that the X axis does not represent time, it simply represents the number of pixels in my oscilloscope screen capture. From line No. 00 to No. 04, I only changed the throttle position and left the direction control in the middle. 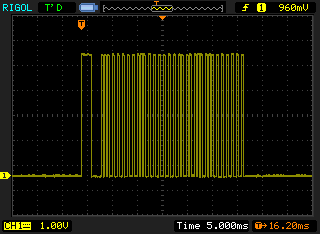 From the decoded waveform you can clearly see that the only number that was changing is the third byte and it is apparent that this value is proportional to the rotor speed. Note that throttle value does not start from zero, this is probably mainly for practical reasons as in only higher RPM range could the rotor generate sufficient lift. And by limiting the potentiometer’s output to this range, a finer adjustment in higher RPM range can be obtained. In line No. 05 and 06, the throttle was placed at 100% and I changed the direction from full left to full right. This resulted a change in the first byte (from 106 to 8). So I inferred that 60 must be corresponding to the center position and the left-right control has roughly 6 bit of resolution from the center. Line No. 07 and No. 08 are the results from moving the direction lever full forward and full backward while leaving the throttle at 100%. As you can see from the decoded data above, the second byte changed accordingly from 1 to 126. So the forward and backward control is coded in the second byte and it has 7 bit of resolution in each direction. No. 09 through No. 12 are basically repeating No. 05 to No. 09 except that the throttle was set to 0. Because potentiometers are used for all the controls, the digitized values may be slightly different from the theoretical values even when the controls are set to the same positions each time. The only byte we have not accounted for so far is the last one. It seems to be fixed at 52 across all the different runs. As it turned out, this byte stores the calibration information and is controlled by the calibration knob on the transmitter. The calibration knob is used to make the helicopter hover without rotating when only the throttle is applied. When the calibration knob is turned right (the helicopter will rotate right when no directional control is applied), this number increases accordingly and when the calibration knob is turned left (the helicopter will rotate left when no directional control is applied), this number will decrease. When trimmed to the appropriate value, the helicopter will be calibrated and will not rotate unless directional control is applied. So now we have decoded the control scheme. Each IR command is consisted of a header, followed by four bytes which encode the rotational direction (left/right), forward/backward movements, throttle and the calibration data. To validate the IR control protocol, I wrote a simple program using an Arduino board. The full code listing can be found towards the end of the post. Basically, I used Timer1 to generate the 180ms command repeat interval. Timer2 is used to generate the 38kHz 50% duty cycle PWM carrier signal. Zeros and Ones are generated by turning on and off the 38kHz signal for the desired duration using delayMicroseconds. 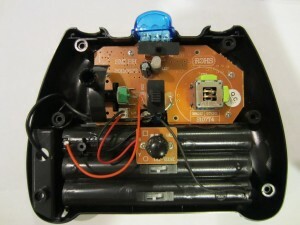 Three potentiometers were used to control rotor speed (throttle), forward/backward movement and left/right rotations respectively. Since the calibration can be done ahead of time, I chose to hard code the calibrated value in code to simply the control a little bit. Of course, you could always use a fourth potentiometer for this purpose. Here is a short video demonstrating the reverse engineered IR control. //it is useful for debugging purpose. Are you using Rigol DS1052 E scope.The image of the captured waveforms? How was that taken. Many thanks for your inspiring work. Thanks for your comment. Yes, the oscilloscope is an RIGOL 1052E. In order to capture the waveforms and stack them up for comparison, I used the long memory (1 meg) option, and saved the results to a thumb drive using the wfm format. The files are then imported in the RIGOL oscilloscope software (the software came with the scope) so that I could convert the wfm format into a readable CSV format. There are many WFM readers out there that could achieve the same. After converted to CSV, I trimmed the waveform so that they start at the same location. I also down-sampled and cleaned the waveform a little bit (e.g. using a threshold to make the 0’s and 1’s cleaner) to make it easier for plotting. Thanks for spotting the error. I was trying to make the code look easier to look by breaking out the calculations of Throttle, LeftRight/FwdBack, and evidently forgot to remove the /4 in sendCommand function call. I have fixed it. Again, thank you for pointing it out. i have an error occured..
Timer1 is an Arduino library, which you can download from here (http://www.arduino.cc/playground/code/timer1). After download, you will need to extract and copy the folder into your arduino installation folder under libraries. For the potentiometers, you can use any linear ones from 5K to 50K (the value doesn’t matter much) and one end needs to tie to the ground, the other end needs to tie to Vcc, the wiper feeds into the ADC pins on the Arduino board. 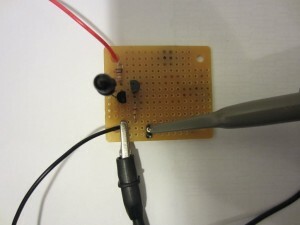 For the IR diode, you can simply connect it to the digital pin 3 via a resistor (say 470 Ohm). For more information, I’d recommend you looking at some tutorials on the Arduino site. Good luck. I also have decoded the signals for some Radio Controlled(RC) toys. The steps is very similar as you done. great hacking! I wounder it be good if we can developed an universal decoder (i.e. it can decode any signals from some kind of toys using IR or RC) and store the commands, finally it become the controller of the toys. I was wondering if you could upload the schematic diagram of the breadboard circuit. Do you have a part number for the IR LED emitter you used? Sorry… I don’t. You can pretty much use any IR LED for this purpose. The bigger ones are better in general as they can be driven with higher current (e.g. 25 to 50 mA), which translates into greater control distance. looking for 0-255. Anything over 127 would shut down the rotors. I’ve figured it all out, but just wondering why this is. Thank you for any input on these issues! According to Jim (http://www.jimhung.co.uk/?p=901), S107G has at least two different revisions and the command structures are different among the two. Could you check yours? From what you described, it sounds like your S107G protocol might be different then the one I reverse engineered? Kerry, Thanks for that link! It makes sense of several issues, but at the same time, causes more confusion! the fourth byte doesn’t do anything with the control of the S107G, which is why changing the CAL_BYTE value had no effect. your Analog to Digital math, throttle is 0-255, left/right is 0-128, and forward/backward is 0-255 ?? Well, the fourth byte does control calibration if your controller uses the 4-byte format, but if it is 3 byte my understanding is that the calibration is embedded in the 3-byte code. Do you have an oscilloscope/logic analyzer to take a look at the waveform? transmitters on the same helicopter without issue. first bit in byte 3. 0 = channel B, 1 = channel A. You have decoded channel B, Jim has decoded Channel A. This is why your throttle values are to 255, and his are to 127.
channel A throttle bits(0-127, or all 1’s in the first bit of byte 3) and it works just fine. I’m suspecting the channel selector on “our” transmitters is nothing more than a simple voltage divider that goes to the throttle lever input. in the controller as well. missing this somewhere in your code?). 1) I think that the 4th byte is just ignored by the S107G, Trim/calibration is definitely controlled by offsetting the Yaw value. I picked up a Syma S800G which has sideways (slide) control and took a peek at it’s control packets. It does appear that the S800G uses the 4th byte for left/right slide control, whilst Trim is again applied by offsetting the Yaw. Interestingly, using the S107G controller (a 4-byte model – S107T2) with the S800G and applying a little throttle while holding it in your hand, the helicopter responds – altering the Trim dial makes the slide servo’s move! Sadly you can’t use the S107G controller to control Slide in the air because the Trim dial is bound to Yaw and the 4th byte, and it makes the chopper go into a crazy spiral..
2) For control purposes, channel selection is just a matter of changing bit #16 to 0 or 1 – though for the physical controllers, the channels also change the packet transmission intervals to avoid packet collisions (channel B’s interval is 1.5x the interval of channel A). As an example of the use of the Channel Bit in practice, I built a controller using an Arduino controlled by a Processing sketch that can control 2 helicopters simultaneously (and independently) with one transmitter by just alternating the channel bit (and using 2 different control value arrays). Could you use a scope to see the output command? Assuming that the signal is received, it appears that the format might be incorrect. It would be hard to debug without verifying the command structure first. Yes… the remote has two sets of operating frequencies (this is useful when you are flying two at the same time). 3 channel simply means you can control up/down, left/right rev up/down. Excellent piece of work. I used the Syma helicopter two years ago when I taught a sophomore level engineering design class at TCNJ. The students – all engineering disciplines – we split into groups of four and given a helicopter to “play” with. The goal of the exercise was to give the students an initial reverse engineering experience. The groups determined parameters such as maximum flight time for hovering flight, maximum duration of operation under max throttle, maximum range for IR remote in different flight environments, e.g. narrow hallway, large open space, dark rooms, brightly lit rooms, outdoors in shade, outdoors in direct sunlight. The students also used a scope to observe the IR signal and were able to “with some help” determine that the scope was showing them a 38 kHz modulated signal with 4 bytes of information. Most were also able to determine which of the bytes corresponded to what channel. I am now at UMass-Lowell and I am preparing to teach a similar type of class. 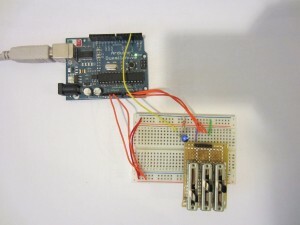 I will be using arduino boards and have decided to create a blimp-bot to show off during introductory lecture. I didn’t keep any notes on what I had done previously with the Syma remote and was starting from scratch – with no scope handy I was using the arduino to decode the signal using a combination of sample codes from adafruit and Ken Shirriff’s IR Library. I had just about pulled it all together when I cam across your post. I am an ME by training and I love learning from well-written code. The blimp-bot will use the helicopter to provide enough thrust to hover in place (the helium blimp will provide lift for the majority of the structure. The system will determine its height using a Ping ultrasonic sensor and a simple PID loop will be used to provide control signals to the Syma. Should work… I’ll send a link to a write-up. Thanks for sharing your story Daniel! Definitely let me know when you build your blimp-bot! 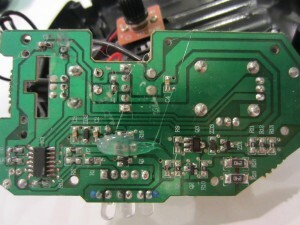 I ended up on your page looking for ways to hack a micro heli rc system. I want to built a micro plane with proportional solenoid actuators. I was interested in IR as it is light and cheap. I already have a couple of old micro helies around and was looking on how to hack them. The problem is that theese helies are single rotor type and there is some mixing between the two chanels. The microcontroller in the transmitter has it’s model erased just as yours. Can you think of a way to get read of the mixing and get two clean proportional channels? Thank you and great job with this post. If the controls are digital, you can record some commands just like what I did with some known states and see if you could see a pattern from these recorded waveforms. If your controls are wireless, you will need to measure the waveform after it is demodulated. Well. Don’t have the equipment to measure that. However from the board i’ve noticed that the microcontoller is 18 pin with vcc vdd on the central pins. That is consistent with pic chips. I will try to read it and see if I can rewrite it. If so, I will still have to descifer the code and change it but my assembler knowlege is quite limited. Hey guys. Maybe someone can help me out here. I have the 107G mini metal and its doing something odd. So the trim dial went bad on the remote. I do electronics repair so I just ordered another same type same model and installed it. Well during the install I noticed the remote main board had a bunch of just horrible solder joints. Its for my 7 year old and we all know they like to drop things so I went ahead and re soldered a bunch of spots. I didnt move any resistors or change their location in way. I just put a little more so it would hold better (in case of a drop). Now… the stupid thing is turning left and right way faster than it should and its no longer flyable for either of us. Its like I changed the response speed or something… Can anyone tell me how to reverse what I did or even an idea as to what I could have done for that to happen. I really like the little bugger and my son… he would like to fly it again too… CAN ANYONE HELP??? I need and would really appreciate it. Thanks Guys. The reason I suspect this is because once the value goes less than -63 the rotation reverses to forward thrust. Nice work by the way and thank you very much for making your work available. I was unsuccessful in my attempt to reverse engineer the signal so your code was a huge help. I was just thinking of picking up a s107 and I’ve been looking at various mods. I was also thinking how hard could it be to set up a computer program that controls one. Thanks to your work it doesn’t look that hard. My thought was to add in a kinect, get the kinect to see the helicopter and then experiment with AI control. Thanks for this great information. I also have a S107G and am curious about doing the opposite: controlling the arduino with the S107G remote. I’d like to build some kind of robot and it would be great to read the signals..
Hey Alex – I wrote a library for Arduino that allows you to do just that, hopefully you’ll find it useful! Also I would be interested receiver, to the pilot. nowhere can I find information on how to do cośtakiego. Also I would be interested receiver, to the pilot. nowhere can I find information on how to do this. this code is useless it say “126: error: ‘Timer1’ was not declared in this scope” on arduino ide…. How can you operate a helicopter with no remote. ? How can you design a remote just with the helicopter.? hi i want to stream syma cam in c# but i cant or bether say i dont now how to do that if ther is a way to do that plz help me .